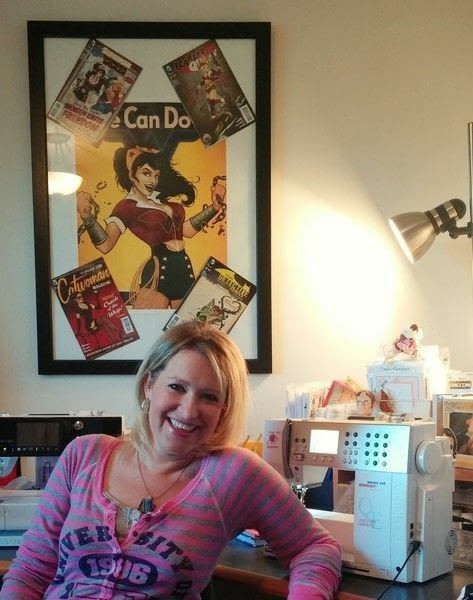 Come behind the scenes at Stacy Sews and tour Stacy's gorgeous sewing room in Wichita, Kansas. I just love that I have a space to call my own! It's large enough for all my machines, books\patterns\magazines, as well as a cutting table, and a place for my kids to sit and visit while I work. Plus, I have a great closet that I can hide my fabric stash and craft supplies. It is a large bedroom that has been converted into a work space. While it is mostly mine, my husband works from home and houses his copier\printer in the corner (I've found it very convenient for printing of sewing PDF patterns). I pretty much do all my sewing from this space: Cutting, sewing, pattern tracing, etc. - I'm able to 'spread out' large projects in this space, leave them in piles until I need them, and shut the door behind me when I'm finished if it looks to messy for anyone to see! I tried to make my space cozy by adding a small couch to sit on with lots of pillows. I use this area to sit and read new, crafty books and magazines and it also gives my children a place to sit and visit with me while I'm working on a project. My most frequently used sewing tools are stored in a rotating caddy next to my machines so that they are always handy. Notions (ribbons & trims, hardware, etc.) are housed in stackable drawers under my table. I try to keep all books and magazines on the two shelves in my room while sewing patterns are stashed in several locations! While my sewing room looks neat and tidy, all bets are off when you look at my fabric stash! The closet looks a bit out of control even though most of the fabrics are folded and rolled so that I can easily see them. Not really, I just do what works for me. There are some great furniture pieces out there specifically designed for sewing\crafters that can help - If I just had the money to buy them! A Wonder Woman poppet that was made for me during a craft swap. My Blythe. I bought her with the sole purpose of making clothing just for her! My collection of Japanese craft magazines and books. I love thumbing through them and occasionally making projects from them. Zombie Bear. It was one of those projects that I just had to make and I love the way it turned out. I am a list maker! I keep a notebook (Wonder Woman, of course!) on my sewing table that I write ideas, jot notes, and write tutorials into. I also have a running list of ideas that I keep on a bulletin board - eventually, I'd love to write patterns for them or include them in a book. The fabric store! So many times fabric seems to 'call to me' as to what it wants to be made into. I suppose this is why my fabric stash has grown to epic proportions! My kids are also a great source of inspiration - it seems like there is always something that can be made that would make their life easier\snugglier\fashionable or they ask for specific items they want me to sew for them. 1. I would love a long arm quilting machine. I admire the beautiful work quilters do and a long arm would definitely make things easier. I don't do a lot of quilting, but I might with the right equipment! 2. Fabric shelves. It would be a great way to keep my material organized and allow me to easily see everything I own. 3. A great middle island style cutting\work table with storage underneath.